A new Virgin of Guadalupe green macrame rosary bracelet. Sturdy nylon macrame cord. The beads are double-sided with the Virgin of Guadalupe on the front and the Divine Mercy of Jesus on the back. The bracelet is adjustable from 6-1/2" up to 9-3/4". 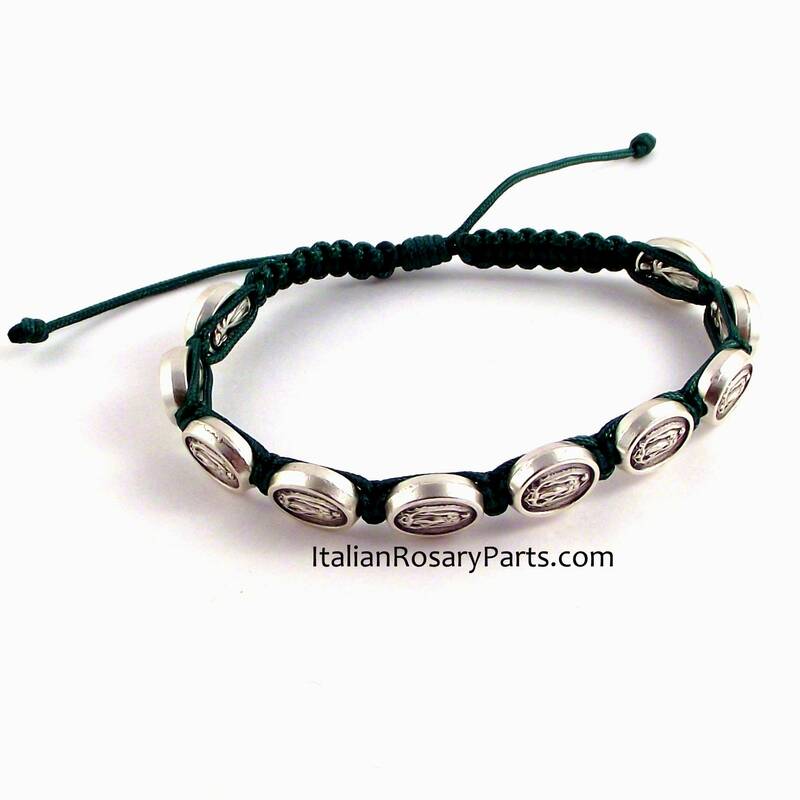 The beads are nickel silver and made in Italy. "Unbreakable Rosaries" is my first stop for a rosary and chaplet shop! This particular chaplet was the model constructed with every bead individually wire-wrapped with silver-plate wire. After many purchases over the years - I can heartily recommend this accomplished artist's work. Every aspect of each transaction has been perfect. Carmen you are the Best! Everything was perfect. This is a beautiful rosary and very well crafted. The Job's Tears are all different gradations of gray and brown tones and have unique shapes and sizes. I love it! I accept Paypal as well as all major credit cards through Etsy's direct check-out system. All sales are final. Repairs, if necessary, are always done free of charge. USPS First Class shipping in the U.S. is a flat rate for any number of items purchased. Priority and Express mail upgrades are also available at check-out for both domestic and international destinations. Shipping insurance is included in the price of all international packages. Please note that import duties, taxes and fees are the sole responsibility of the purchaser and are not included in the price of your item, nor in the shipping fees. Please check with your country's customs office to determine if import charges will apply and what additional costs may be incurred. International packages that are returned to the U.S. for lack of payment of import taxes will only be reshipped once the buyer pays the additional postage fees.